Well, we're down to eight days. My classroom is being packed up, the kids are hard at work preparing for the end of year field day and talent show, and I'm anxiously sorting through assessments to put in my 50 or so data points for each student on our standards-based report card. One of the things that always bothers me at the end of the year is that so much student work goes into the trash can. After all, you can't save everything! Take our reading journals. To me, they are special little treasures of all of the thinking that students have done throughout the year. Each one is a neat window into a student's thinking at that particular time. I hate to think of these being thrown away. In years past, I have avoided talking about what will happen to the items that we have created together. But this doesn't lead to students taking home their school materials to be put in a special place of honor. Instead, the conversation goes like this. "Mrs. Kissner, do we need this anymore?" a student asks, holding up a folder. Me, thinking about how the next few days are filled with end of year mania: "Um, no, I don't think so." To which the student says, "Good," and proceeds to throw the item into the trash can. In years past, I have started to beg them not to throw things out in the classroom. This only leads to kids going into the hallway to make their deposits in the big, wheeled trashcans that our custodians use. It's not that the kids hated our reading class; rather, it's that 9 and 10 year olds, especially boys, do not feel the same attachment to the artifacts of their thinking that I do. This year, I decided to be proactive. Instead of avoiding the issue of what to do with all of our accumulated classroom stuff, I decided to have the students turn it into booklets that tell the story of our year together. (A booklet! A beautiful memento that is too beautiful to wind up in the trash!) I typed up little titles for each page, telling about highlights: Independent Reading, Thinking about my reading, Topic Study: Antarctica and so forth. We're using the large 12 x 18 pages of construction paper, held landscape style. Each day, I hand out a new little title. Then students use scissors to cut artifacts from their reading journals. (Allowing them to cut and tear from the reading journals satisfies their thirst for destruction!) I've printed out some photos for students to add to their books as well, and they're adding captions with index cards and scrap paper. We work on the books for about 15-20 minutes each day. It's been a delight to talk about their learning each day. Students are going back to their reading folders, revisiting old topics, and thinking about our year together. It's a busy, productive activity that gets us all reflecting on how far we've come, even as we know that our time together will soon be at an end. The reading folders are turning into hollow shells of what they once were, with all of their meaningful parts cut out and pasted into our books. And hopefully, when this is done, we'll have a product that is just too beautiful to be discarded. I had over 70 comments on my kid nature blog today! (And they're not spam, which is even better.) After I checked to make sure that they were all appropriate, I showed the comments to my students so that we could talk about them and try to figure out who wrote them. It was a great learning experience. I'm wading through the comments so that I can post and respond to them. Check them out on A Kids' Guide to Exploring Nature. They are adorable. In other news, I had a blog post published on the Teaching Tolerance website. I'm so thrilled! It was the best news of the day. Last time, I wrote about how manipulatives can help readers who can decode words, but are having trouble with comprehension. Drawing can be another way to reach these readers and help them to build elaborate mental models. For a long time, I felt that using drawing during reading class was--well, cheating. How can something that kids like so much be beneficial? I worried that kids would become so focused on creating pictures that they would not make much meaning from the text. But drawing is a great strategy for all readers. When readers try to make a picture to represent the ideas in a text, they have to think about those ideas in a new way. Here are some ways to help students--and especially those with poor comprehension--build meaning. In a review of research on drawing as a learning technique, Peggy Van Meter and Joanna Garner found that strategies that include some instructional coaching are especially helpful. I like to do this with students as we read sections of text that are rich in setting details. Using the Promethean board or a piece of chart paper, I'll show students how I take details from the text and put them into my picture. As I help students draw to represent ideas from the text, I try to highlight the relationships between items as well as key vocabulary. Don't put down your own drawing ability! Once, as I was drawing a sketch on the chalkboard, I offhandedly said to students, "I'm not a good artist." No sooner had the words come out of my mouth than I realized what a mistake they were. I wouldn't want kids to say, "I'm not a good reader," and then quit trying. So I changed my words. I said, "Wait--that's not what I meant. This picture didn't come out very well. Let me look back at the text, think about the details, and try again." Content area texts can be a challenge to readers. Drawing can help them to understand how ideas fit together. When my students were reading about caves, they finished the reading by creating a picture and labeling the formations with vocabulary words from the text. This activity required the kids who had skipped quickly through the text to go back and reread the sentences that described the different formations. The task of drawing caused them to realize that their comprehension was not what it should have been! For me, some of the hardest readers to reach are those that seem to decode accurately and quickly, but have trouble with retelling or answering questions. Sometimes these readers are called "word callers". They have often done just fine with reading in the primary grades, when their ability to decode quickly and accurately puts them at the top of their class. In fourth grade, however, things start to change. As text becomes more complex and readers need to make more inferences, these students start to feel a little lost. They might look around the room and see the other students quickly writing summaries, while they struggle to think of what to include. They might listen to a conversation about the theme of a story, but not understand how stories can show different themes. It's easy for these readers to become frustrated--reading used to be so easy, but now it's so hard. As I wrote about in January, these readers may not be building elaborate mental models. A mental model is a reader's impression of a text and understanding of the main ideas. Dr. Gary Woolley's article, "Developing Reading Comprehension: Combining Visual and Verbal Processes" is an excellent introduction to helping students to build mental models. One of the ideas mentioned in the article is the use of manipulatives for reading. While much of the research about this focuses on manipulatives for early readers, I've found this strategy to be useful in the intermediate classroom as well. When readers have to move around pictures and objects, they have to make more meaningful connections between ideas in the text. It's not enough to just read a sentence and blunder on to the next--the reader needs to stop, find the relevant pictures, and show how they carry out the actions in the text. I've tried to create some items for my classroom, using simple illustrations for the manipulatives. Once students are familiar with the process, they are eager to create their own retelling figures. This is a great activity, because it harnesses both drawing and manipulative use to enhance comprehension. While I started using this activity to help the word callers, I found that all of the readers in my room enjoy this. If you haven't tried manipulatives with your readers, the end of the year is the perfect time to try it out. Kids find this strategy inherently motivating, while you can do some "kid-watching" to see how all of your readers--and especially those who show word-calling tendencies--react to this kind of activity. Here is a very simple text with pictures. Making all of this work with the Common Core Standards...in a way that keeps our classrooms fun and engaging! If you are not teaching in York or Adams County, but would like to attend, please contact me. As our literature circles have moved from fiction to nonfiction, some of the conversations have been getting--well, flat. This is to be expected with any classroom activity. When creative and imaginative activities become routine, they lose some of their effectiveness. So it's up to me to try to recapture the excitement! I wasn't really thinking about this, though, as I was picking up my students from lunch today. But I soon got dragged into a heated discussion. "Mrs. Kissner, Mrs. Kissner!" two boys called. "Which one is stronger--a bull shark or a great white?" This is not a question that I have considered often. So I absentmindedly answered, "Great white, I guess." This set off a new flurry of comments and whispering, all as we were walking down the hallway and back to the classroom. The disagreement didn't end there. "The bull shark is the most dangerous, because it can go in shallow water and that's a bad place for a person to be when a shark is around," Wyatt said. More kids starting to chime in, from the boys who had originally started the conversation to the others who were clamoring to figure out what was going on. Claims were made, details offered, counterarguments shot back. A thought was slowly forming. This was the kind of passion and spark that our literature circles were missing! Later, as we talked about the literature circles for the day, I brought up this conversation. "What made you so interested in talking about the two kinds of sharks?" We picked it apart--how all of them at the lunch table had some shared knowledge about sharks, but some different ideas. None of the boys had read which shark was most powerful or dangerous. Instead, they were making inferences and claims based on the details they knew. "That's just the way it is with literature circles," I told the students. "You've all read the same book, but you have different ideas. This week, as you talk about the questions you've prepared, try to have an interesting disagreement! How are your ideas different? How can you support them?" When I put it like this--that literature circles are supposed to be about some amount of disagreement--it added some new zip to their conversations. I saw more students going back and opening up their books, pointing to phrases and photographs, sharing their ideas. But I still feel like I have some unfinished business. Because, while I was watching their literature circles and walking around, I felt an irresistible urge to go to my computer and do some research. And I couldn't get rid of the nagging question. Which is more powerful--a bull shark or a great white? As the year draws to a close, I find myself teaching more and more about comparing texts. This is the perfect topic for the end of the year, as we have so much shared history and shared readings. Why do we compare texts? Sometimes the process of comparing helps us to think more deeply about texts, finding details that we didn't know were there. And sometimes the process helps us to see how texts that seem quite different have many things in common, and how there are common themes and ideas that come up again and again in literature. For my fourth graders, just starting to think at a higher level, comparing texts is a great way to open up their thinking about the great world of literature. Here are some things that I've learned can really help kids to compare texts effectively. 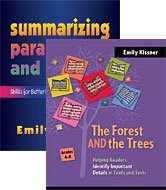 Share lots of high quality books: The books that I read over the last few weeks for inferring work perfectly for comparing. When kids have read a variety of books that share common themes, the task of comparing is easier--and lots more fun. Teach students to generate criteria: I started my lesson by showing kids a terribly written paragraph that compared two stories based on insignificant criteria--the number of words in the title, the number of letters in the character's names, etc. Students recognized right away that this paragraph was pretty silly! Then, I gave students cards with different criteria written on them. They sorted the cards based on "significant" or "not significant". For example, "genre" is significant, while "use of the letter r" is not. (Kids appreciated this one!) Some, like "animals in the text" could go either way--it depends on what is being compared. We ended up sorting the cards three times over the next week, reviewing what made the different criteria significant or not. The students had so many experiences with looking at how texts can be compared that they easily came up with significant criteria on their own. Make it a game! If you use a Texts We've Shared Wall, start off a conversation by asking kids to browse the wall and look for two texts that would be easy to compare. Why? Then, look for two texts that would be very hard to compare. Why are these two so different? Can anyone find any significant similarities? This task helps kids to think more flexibly about comparing texts, looking at it as a fun challenge instead of a chore. Put transition words in front of students: Give students the words they need to write compare and contrast text. Words like on the other hand, however, both, also, similar, and different...these words make comparing and contrasting infinitely easier. A page with different compare and contrast transition words will help students to write better paragraphs. Weave in the editing: This is the perfect time to address finer points of which titles get quotation marks and which get underlined. Because students will be going back and forth between talking about the different texts, they have a real reason to use this punctuation. Comparing texts is a great end of year activity...and it can be lots of fun!